INCREDIBLY CHEAP: I’m Trading This NOW! 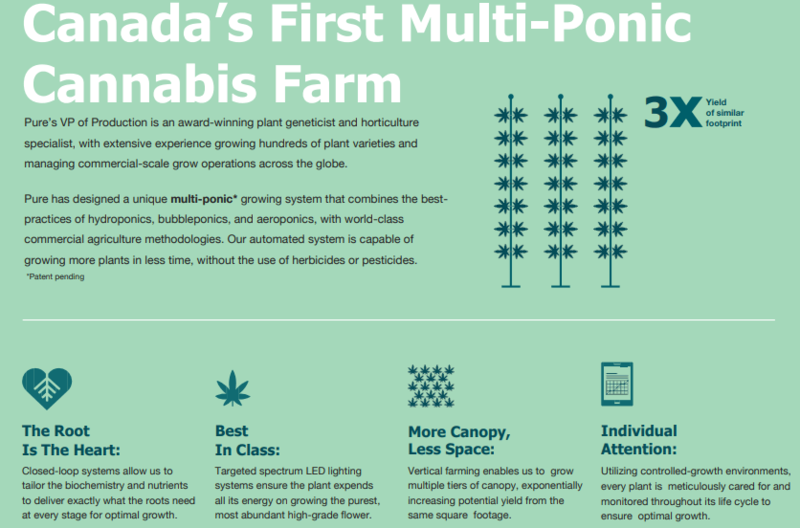 With CAD$14M in cash, zero debt, and with the 8,000KG facility already fully-funded, I’m shocked that PURE Global Cannabis (TSX-V: PURE & US: PRCNF) has a market cap of only CAD$34.7M. This puts the value of assets, tangible and intangible, at only CAD$20.7M. When analyzing this business, concerning its noticable undervaluation, we’ve already seen that it is nearly 90% cheaper than the median of the 30+ other medical-grade licensed producers, but, on top of that, in absolute terms, it is also a bargain. Subtracting CAD$14M in cash from the CAD$34.7M market cap leaves us with an enterprise value of CAD$20.7M. If the company were to auction-off its assets today, liquidate the operation, in other words, Wealth Research Group is certain that a strategic investor would pay a much higher price tag than what the public markets are valuing this business at. Pioneer: It is days away from becoming part of only 30+ publicly-traded companies in Canada to secure a license to sell medical-grade cannabis. Several such companies are already billion-dollar operations, such as Canopy Growth (CAD$15B), Aurora Cannabis (CAD$8B), and Aphria Inc (CAD$3B). This license allows it to start generating revenue, which is huge. To receive this coveted license, it is not only a matter of time, months on end, but also of meeting specific requirements and standards, so it is an incredibly valuable achievement. It’s a deal-breaker, if you can’t obtain it. Gaining it places you in a very exclusive club of stocks. Strategy and Branding: Through its partnership with PureSinse, Malay Panchal and the management team are looking to break away from being deemed as only a cannabis company. Instead, they’re working tirelessly to brand their products for the wellness industry, which is much, much larger in size. We’re on the launch pad right now because, with the coming stamp of approval from Health Canada, nothing is holding the company back any longer. In Q1 of 2019, their fully-funded facility will, most likely, turn into a cash cow, and their branding efforts should position them to sell their products to a broader client-base than anticipated. Already, they have a strategic alliance secured with Appletree Medical Group, which has 700,000 patients! Patents and Technological Advantage: This is, by far, the most significant intangible asset that shareholders possess, the unique agricultural technologies, which are patent pending. We’re talking about game-changer material with the Multi-Ponic growing system. Combined, the (1) alliance with Appletree Medical Group, (2) the Multi-Ponic patent pending growing system, (3) the upcoming (imminent) approval of the sales license, which puts the company in bed with only 30+ stocks in Canada, but with a 90% discount to the median of them, and (4) with the branding expertise to be labeled a wellness retailer, this is a grand slam. September 12th was the peak for the share price at CAD$0.45, on intra-day trading. Raised CAD$10M and now has a CAD$14M cash position. Completed the application process and is now waiting for the final government announcement on its sales license approval. Already been purchasing the most state-of-the-art oil extraction equipment. The share price is in “Extreme Value” mode, as Warren Buffett calls his biggest winners. 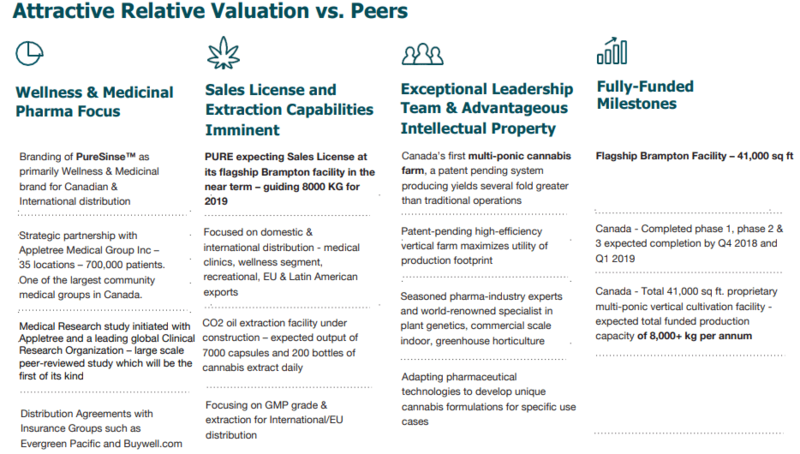 PURE GLOBAL CANNABIS (TSX-V: PURE & US: PRCNF)! This work is based on SEC filings, current events, interviews, corporate press releases and what we’ve learned as financial journalists. It may contain errors and you shouldn’t make any investment decision based solely on what you read here. It’s your money and your responsibility. Never base any decision off of our emails. Never base any decision off of our emails. WealthResearchGroup.com stock profiles are intended to be stock ideas, NOT recommendations. The ideas we present are high risk and you can lose your entire investment, we are not stock pickers, market timers, investment advisers, and you should not base any investment decision off our website, emails, videos, or anything we publish. Please do your own research before investing. It is crucial that you at least look at current SEC filings and read the latest press releases. Information contained in this profile was extracted from current documents filed with the SEC, the company web site and other publicly available sources deemed reliable. Never base any investment decision from information contained in our website or emails or any or our publications. Our report is not intended to be, nor should it be construed as an offer to buy or sell, or a solicitation of an offer to buy or sell securities, or as a recommendation to purchase anything. We have entered into a three year agreement with the company, purchased shares, and have received three hundred and ninety thousand dollars paid for directly by the company for digital marketing. This publication may provide the addresses or contain hyperlinks to websites; we disclaim any responsibility for the content of any such other websites. Please use our site as a place to get ideas. Enjoy our videos and news analysis, but never make an investment decision off of anything we say. The information herein is not intended to be personal legal or investment advice and may not be appropriate or applicable for all readers. If personal advice is needed, the services of a qualified legal, investment or tax professional should be sought. A Very RARE OPPORTUNITY in the Technology Sector: Where I’m Positioned Now!